"We're proud to offer offer a range of heavy-duty clarifier tanks, along with design flexibility to perfectly suit your requirements"
Please see our clarifier tank range below, or contact us today to discuss your custom requirements. 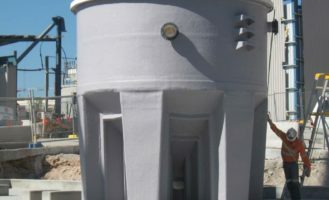 An Ajay Fibreglass clarifier is a settling tank used to remove solid waste particles from water. When the clarifier separates the concentrated impurities, the sludge formed by the process discharges from the bottom of the tank. These extra heavy duty tanks are mostly used in water treatment applications and are available in six standard sizes (3000 litre – 30000 litres). Custom designed tank sizes are also available and we are always happy to meet our client’s special needs. Contact us today for an obligation free quotation. Delivery can be arranged Australia wide.